A young farmhand named Link leaves his village to rescue local children from a monster, but he is drawn into an encroaching twilight that is corrupting Hyrule. The Twilight transforms him into a wolf and he is captured. He meets a mysterious imp named Midna who agrees to help him escape in exchange for his help stopping the Twilight Realm merging with Hyrule. 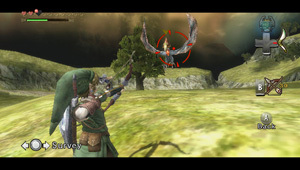 Link must use his human and wolf forms plus his array of weapons and items to explore Hyrule, restore the Light Spirits and defeat Zant, the evil Twilight king behind the corruption. 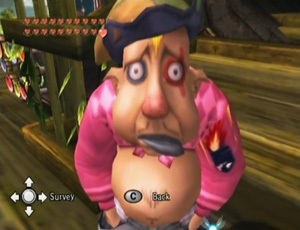 Head to the bottom of Lake Hylia where you will find a clown named Fyer running the cannon shop. Look at his left arm and you will see artwork of Bullet Bill from the Super Mario series. Visit the Fishing Hole in Upper Zora's River. 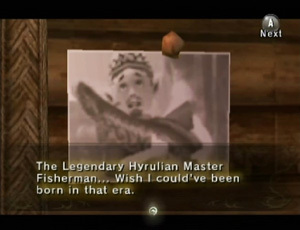 One of the pictures on the wall shows the Fishing Hole owner from Ocarina of Time as he appeared on the N64. The new owner calls him the Legendary Hyrulian Master Fisherman. There is evidence that the current Fishing Hole owner is a descendent of the N64 Fishing Hole owner, as they both appear to suffer from the same itchy back. Head through the empty shop filled with Gorons in Hyrule Castle Town until you reach a balcony. The Goron out here sells you arrows. The first time you speak to him he will say "It's a secret to everyone!" This line is taken from the hidden shopkeepers in The Legend of Zelda. Two of the children in Ordon Village are named Malo and Talo, inspired by the characters Malon and Talon from The Legend of Zelda: Ocarina of Time. Throughout Hyrule you will find Howling Stones, rocks marked with the Sheikah icon with a hole through the middle. As Wolf Link, you have to howl along to the musical wind that blows through them. Nearly all of the songs are from earlier Legend of Zelda series games.